Of the three cars debuted by Abarth at the Frankfurt International Motor Show, the Abarth Cabrio Italia is closest to the US spec Fiat 500 Abarth we’re going to see at this year’s Los Angeles Auto Show. Now that Frankfurt has come and gone, more details and photos have been released of the Cabrio Italia. All 150 models will come with the blue “Abu Dhabi” paint, which is also available on the 695 Tributo Ferrari. It will come with tinted rear windows, xenon headlights, and a dual exhaust. From the the Esseesse it will get the Brembo brake kit, painted yellow and nestled behind 17 inch “diamond” chromium-plated wheels. Powering the car is Fiat’s 1.4 liter T-Jet engine, with a turbo added for up to 140 horsepower. My favorite feature of the car however are the “Corsa” lightweight racing seats by Sabelt. 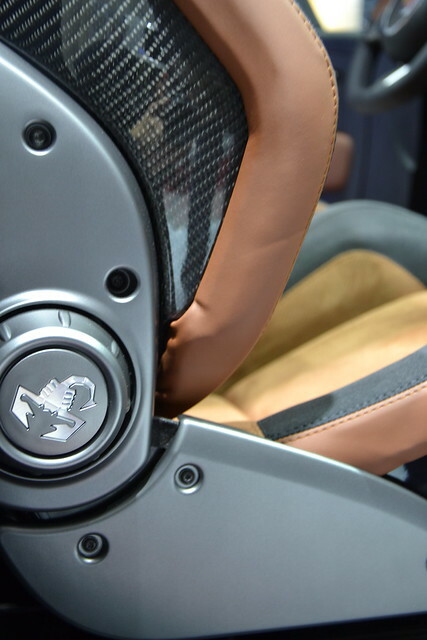 These beautiful, performance oriented seats are covered in Italian leather, Alcantara, and a carbon fiber shell backrest. Check out the Team Abarth Flickr photo set for some high quality shots of these seats, and the rest of the car. No pricing information has been released, but since they are only releasing 150 of these special edition Fiat 500s, I imagine there will be a significant exclusivity tax. My only hope is that they eventually offer these seats as an option on the US bound Fiat 500, because I would certainly pay for those. Check out the video below to listen to a finely dressed Italian man narrate the features of the Cabrio Italia.